Do you want to use an iPhone with Tracfone Wireless? Well you can and in this article I’ll explain what you need to know. Tracfone Wireless offers affordable cellular service for customers with modest needs for a cell phone service. Many people would love to take advantages of all the benefits of using an iPhone without having to pay $600 or more per year for cell phone service. With Tracfone, you can have an iPhone or other smartphone with active service for as little as $125 per year or just under $11 per month. This a great option for someone that wants to use an iPhone but doesn’t talk on the phone much and plan to use your iPhone with Wi-Fi to for Internet Service. If you want to use an iPhone with Tracfone you’ll have a choice to buy and iPhone directly from Tracfone or you can Bring Your Own iPhone to Tracfone. Tracfone sells as limited number of iPhone models. They usually do not offer the latest model iPhones instead opting to sell less expensive models from previous years. Sometimes you can get a really good deal on an iPhone directly from Tracfone, See my Tracfone Deals Page to see the latest deals and offers available. Do you want to sign up for Tracfone and use it with your own iPhone? Well, you can and in this article I’ll explain what you need to know. I’m writing this article in April 2019 and as of this time there is a long list of iPhone models that can be used with Tracfone including the iPhone XS Max, iPhone XS, iPhone XR, iPhone X, iPhone 8 Plus, iPhone 8, iPhone 7 Plus, iPhone 7, iPhone 6s Plus, iPhone 6s, iPhone SE, iPhone 6 Plus, iPhone 6, iPhone 5s, iPhone 5c, and iPhone 5. Note that as of April 2019 I do not recommend the iPhone 4s, iPhone 4, and earlier models for use with Tracfone and these phones do not support 4G LTE networks. When you sign up for Tracfone, you’ll have a choice you can buy an iPhone directly from Tracfone or you can Bring Your Own iPhone. Tracfone doesn’t have a wide selection of iPhones available but sometimes you can get a really good deal on an iPhone directly from Tracfone. Sometimes you can buy the same brand new iPhone for less from Tracfone than you could if you bought it directly from Apple and sometimes for less than you would pay for a refurbished or used iPhone online from Amazon, eBay, or Craigslist. Each month I post the latest Tracfone deals here, so check that out if you don’t already have an iPhone to use with Tracfone. Before trying to bring your own iPhone to Tracfone it’s important to understand how Tracfone works. Tracfone doesn’t have their own cellular network, instead they uses either AT&T’s, Verizon’s, or T-Mobile’s cellular towers. When you use Tracfone, your phone will be on one of these three networks. 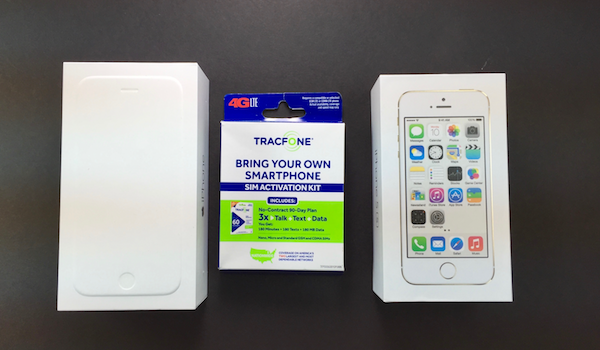 When you bring your own iPhone to Tracfone you’ll need to buy a Bring Your Own Phone SIM Kit in a retail store or online directly from Tracfone. If you already have your iPhone, you’ll need to buy or use the SIM Kit that is compatible with your phone. Most people that bring their iPhone to Tracfone bought that phone from their previous carrier which is most likely AT&T, Verizon, T-Mobile, or Sprint. If your iPhone was from AT&T or T-Mobile it will work with the Tracfone AT&T or T-Mobile SIM respectively without a problem. If your iPhone is from Verizon, it needs to be eligible to use it with Tracfone’s Verizon SIM. To find out you’ll need to check the phone’s serial number on tracfone.com to see if it can be used. Verizon requires that the serial number of any phone that is activated to use their towers. (its a Verizon thing, same for Sprint, but not AT&T or T-Mobile). If your Verizon iPhone was reported lost or stolen you will not be able to activate it. If your Verizon iPhone is currently under contract on a payment plan it will not be eligible. This works out well because if you are say an AT&T customer with an AT&T iPhone you can use it with Tracfone’s AT&T SIM. The iPhone is compatible with AT&T, AT&T should have service where you use your phone because you were an AT&T customer, and Tracfone most likely has coverage on the AT&T towers in the same area. The same for Verizon and T-Mobile. Where it gets a little tricky is if your iPhone came from one carrier but you want to use it on different towers with Tracfone. For example, you have an AT&T iPhone but want to use it with Tracfone’s Verizon towers. I get a number of questions about whether or not your iPhone can be locked or unlocked to use it with Tracfone. It depends. If your AT&T iPhone is locked you can still use it with Tracfone’s AT&T SIM card. Same for a T-Mobile SIM iPhone. Verizon iPhones are not locked but you need to check the serial number to make sure it can be used with Tracfone’s Verizon SIM. Ironically because Verizon iPhones are unlocked and compatible with the AT&T and T-Mobile networks you can use the phone with either Tracfone’s AT&T SIM or Tracfone’s T-Mobile SIM. A locked iPhone is when your wireless carrier set up your phone to prevent it from being used with a SIM card from another wireless company. Sometimes wireless carriers do this to prevent you from taking a phone on a contract or payment plan and using it with another service before you have completed your payments. So even if your iPhone is compatible with another network, it won’t operate with another companies’ SIM card. Most carriers will unlock an iPhone for free after you have met their requirements in their unlocking policy, see Unlocking Your AT&T, T-Mobile, Verizon or Sprint iPhone. If you are unsure whether your phone is locked or not you can borrow a SIM from a friends phone (that uses a different carrier) and try it in your phone. If you can make a call with it, the phone is unlocked. If you want to buy a brand new iPhone that is unlocked and can be used on any of the four networks in the US, Apple sells what they call the “SIM-free” option of each model phone they sell. The phone is unlocked and can be activated on any service that uses the AT&T, T-Mobile, Verizon, or Sprint networks. No other retailer sells SIM-Free models, except for Best Buy that currently sells only the SIM-Free iPhone X. If you are a new customer signing up for Tracfone you’ll have a choice of keeping your current phone number or have Tracfone assign you a new one. If you choose to transfer your current home or cellular number to tracfone you’ll need to make check with Tracfone to make sure your number is eligible to be transferred. In addition to your phone number you’ll need to know your account number and pin for with your current phone company. Your account number may or may not be your phone number. Your account PIN is a password set on your account to prevent someone else from transferring your phone number without your permission. Note this isn’t the PIN code you may have set to unlokc your phone. If you are currently a Tracfone customer you can transfer your current phone number and existing balance of minutes, text, MBs, and service days to your new iPhone. Note that when you transfer service to a new phone your new phone may not be eligible for some plan features such as triple minute plans and one year service days add-ons. As of 2019 most tracfone smartphones are not eligible for such features. Note that all Tracfone smartphone plans include a fixed amount of minutes for calls, messages for texts, megabytes (MBs) for data (internet), and service days. The $125 plan describes above comes with 365 days of service, and 1500 minutes of talk, 1500 text messages, and 1500 Mb of data (1,5GB). So while your account will remain active for one year if you use up your minutes, messages, or data you’ll need to buy more. Tracfone does not have their own cellular network. Instead they use AT&T, Verizon, or T-Mobile’s towers. If you buy an iPhone directly from Tracfone it will probabally use Verizon’s towers. Before you buy your phone, you can ask their customer service agents which towers the phone will use. Tell them the model phone you want to buy and the zip code where you want to use the phone. If you are going to bring your own iPhone to Tracfone, you’ll have the choice of using their AT&T, Verizon, or T-mobile SIM card. Pick the network that works best in your area and one that your iPhone is compatible with. If you want to use their Verizon towers, you’ll need to make check the serial number of your phone with Tracfone to make sure it that it is eligible to be registered on their Verizon networks. Some model iPhones are compatible with more than one carrier. If your iPhone is locked to AT&T or T-Mobile it should still work with Tracfone’s AT&T or T-Mobile SIM respectively. If your iPhone is unlocked, you may have a choice of which network to use. At some point, I’ll post and article with more information about the different iPhone models and their compatibility. Leave reply below if you are interested in seeing that. I updated this article for 2019 as I noticed that it was still popular. If you are interested in some of my earlier articles and videos about using the iPhone or another smartphone with Tracfone see the links below. My daughter upgraded her AT&T iphone. I am a TracFone Customer and want to use her iphone7plus but heard that data can’t be added to it. Is this true? You can transfer your current number and remaining tracfone service balance to that iPhone 7 Plus using a BYOP SIM kit. Going forward, you’ll need to purchase their smartphone plans. All those plans include data. You can also by 1 GB data add-ons for $10. I bought my Samsung TracFone from HSN and it has 3X the minutes for life. I’m planning on buying a iPhone 6 that is unlocked but before I do, I would like to know, if I move my plan to the iPhone will I still have my 3X the minutes for life plan? It’s a good question. I’ll answer it in an article later today. I’d say avoid the iPhone 6 though. The iPhone 6s is a MUCH better phone and you can find a good deal on one. I do not have a definitive answer for you, but hear is what I can say, and I will ask my readers…Can I Keep My Tracfone Triple Minutes When I Switch to a BYOP iPhone? I have a 4s I phone iMessage #99 000185 422538 0. When I check to see if I can bring it to trac phone it says it is not compatible. I used this phone on Verizon and it has not been unlocked. I there a way to use this phone? Hello, I need help. I bought a refurbished unlocked iPhone 6s (verizon) to use with my current Tracfone account. I checked the IMEA with Tracfone and it passed. I transferred the phone number successfully and the phone works. The problem is that I don’t get good reception at home, so I wanted wi-fi calling. Tech support says it is possible, but I can’t find the command in Settings to enable it. Under Phone (iOS 11,4,1) I look for Enable Wi-Fi Calling” and it isn’t there. How can I turn it on?? I called tech support several times. the first guy said that I needed a T-mobile used phone that would take a micro-sized SIM to use wi-fi calling. Have you heard of that? I called back again the next day to confirm that before I buy a new phone, but the second techie said that the size of the SIM did not matter, but it had to be a T-mobile or ATT phone. Is that correct? Even if the T-mobile phone uses a nano-sized card? As you can tell, I’m very confused and still don’t have wi-fi calling. support for Wi-Fi calling on the different tracfone brands is spotty. Officially, they claim you need to be on their t-mobile network with a T-Mobile phone. They don’t list the phone models that support Wi-Fi calling. I have not been able to get Wi-Fi calling to work on any of the Tracfone brands when using the Verizon towers(Straight Talk, Tracfone, Total Wireless, etc). Recently I was able to use Wi-Fi calling with the ATT towers on Straight Talk but it doesn’t seem to work for Tracfone’s ATT towers. Your iPhone 6s is fully compatible with T-Mobile (even though it isn’t a t-mobile phone). You can get a Tracfone T-mobile nano SIM and transfer your number to it. You may find that wi-fi calling then works. You may need to enable it both on your phone and with tracfone https://e911-reg.tracfone.com/. Keep in mind if you do this your phone service will use the t-mobile network rather than the verizon one. I have no idea which towers are better in your area. You can pick up a SIM kit in best buy or target for a dollar or order a sim online. You just need to activate the SIM by transfering your service to it online. its easy. I haven’t tried a tracfone t-mobile sim in my iPhone myself so I don’t know that wi-fi calling will work. You could activate the SIM on a new number with the cheapest possible plan to check if it works. Some readers have reported that a phone on tracfone’s Verizon network can use a verizon signal booster like this https://www.verizonwireless.com/accessories/samsung-4g-lte-network-extender-2/. If you are willing to switch wireless carriers, I reviewed Simple Mobile (also a tracfone brand) it uses the t-mobile network. It supports wi-fi calling and is a pretty good deal at 20 per month see https://ww2.simplemobile.com/serviceplan?session=reset. Check out my youtube channel to see my videos about it. Hello I was wondering if a refurbished unlocked iPhone 7 would work with TracFone, Thank You! With the Tracfone’s AT&T or Tracfone T-Mobile network yes. To use Tracfone’s Verizon network, it needs to be a Model A1660 and you still have to check the phone’s serial number to make sure it is eligible. Yes it will. You remove the SIM card from the iPhone 5s and put it in the iPhone 6 and the tracfone service will work. You still have to backup the iPhone 5s and restore it to the iPhone 6 using iTunes or iCloud to transfer all your stuff, but that doesn’t have anything to do with tracfone. Personally, I wound not choose the iPhone 6 in 2018. I’d consider either the iPhone SE or the iPhone 6s. Both are way better phones, way better. You can get a new iPhone SE from tracfone for at least $150 less than the MSRP from Apple. Also, realize that if that used iPhone 6 did not have a new battery installed the phone may be running way slower than it did new. If you go with the iPhone 6 take a look at Apple’s $29 battery replacement program. Its a killer deal. The iPhone 6 isn’t a bad phone, it just that it is a few years old and specs for the camera, processor, and memory in the SE and 6s are a significant improvement. It’s ok. Believe it not sometimes I get two people with the same first name asking questions at the same time and I get confused. one last thing, a GSM unlocked phone would work as well, right? An unlocked phone is always a better option. An ATT locked phone will work with Tracfone’s ATT network, but not their other ones. I hope its okay to ask my questions here as I am still a bit confused, you may not remember me but you helped me transfer my husbands old Tracfone triple min android to an old iPhone 4s A1387 3G I think..you helped me with an email address back then and even helped me draft the email to get it all sorted out, I didn’t need any sim in that one at all and still have an unopened second tracfone smartphone sim kit (if its still accepted to use) that is still the triple min one…well our neighbor gave us her iphone 6 that she just couldn’t get used to as shes 88 and got an android instead, both are thru straight talk and her service will end the 14th. for the iPhone. I am confused to which sim I would use. any info would truly be appreciated! Yes I do remember. The old SIM kit should still be fine. That kit should have both ATT and VERIZON (CDMA LTE) SIMs. First you need to decide if you want to use the ATT SIM or the Verizon one. The ATT SIM will work in that iPhone 6. The Verizon one might work. You need to check phone’s serial number on tracfone.com. So, do you have a preference for the ATT or Verizon network, does one work better than the other? Oh. and do you know does your husband get visual voicemail on his iPhone? I would like to purchase a certified, refurbished iphone 6, 64GB, Unlocked GSM model from Gazelle. I currently use an iphone 5 with Tracfone service and have been very happy. But the phone is having some issues and I want to move to the iphone 6. When I check the network compatibility chart on Gazelle’s website it says Tracfone is not supported. I contacted Tracfone directly and they told me the unlocked GSM iphone 6 will indeed work on Tracfone as long as it is using bands 850 – 1900 Mhz. According to iphone 6 spec sheets all GSM iphones work within 850 – 1900 Mhz, so I’m assuming it will work. I’ve researched for hours but can’t definitively find an answer. Gazelle says “no”, and Tracfone says “yes”. Can you provide any guidance on whether it is safe to order the iphone 6, unlocked GSM from Gazelle and use it on Tracfone? Thanks! I haven’t tried it myself, but those iPhone 6 should work with Tracfone’s ATT network. You won’t know if it will work with Tracfone’s Verizon network unless you check the the MEID or Serial number of that specific phone on tracfone.com. I’d say Gazelle is just being conservative, saying the phone will only work with AT&T. It’s definitely compatible and even if the iPhone 6 came from ATT and was locked it would still work with Tracfone’s ATT network. That said, I wouldn’t buy an iPhone 6 myself. You’d be so much better off getting an iPhone 6s. Or consider getting a new iPhone SE directly from Tracfone. See Tracfone Is Selling the Apple iPhone SE for $159. The SE is currently $199 but if you bundle it with a plan and use the code TRACEFONE15 you’ll save 15%. With a $15 plan the phone goes from $199 to $184. The iPhone SE has the iPhone 5S body but many of the internals match the iPhone 6s. I have a Canadian Iphone 5s. For several years when in the US, I have used Tracfone. Last year the tracfone battery started leaking and I was told to throw the whole telephone away, therefore I am in need of a replacement phone. Instead of buying another phone, I had my iPhone 5s unlocked so I could buy a SIM card from tracfone and use this in my iphone 5s. On the iPhone box it states that it is compatible with GSM, UMTS, and LTE cellular technologies. Do you know whether or not this will work? The phone is compatible with the US networks. It does need to be unlocked though. Try borrowing an AT&T or Verizon SIM from a friend and try it in your iPhone and if it works the phone is unlocked. you can also check with your Canadian carrier and ask them to unlock it. Tracfone uses either the AT&T or Verizon network, ask people you know in the US which network works better. If you spend more than 50% of time in the US you can find some prepaid services that work in both countries too. Hi smartphone matters. This atricle and accompanying youtube video, got me using tracfone for my needs exclusively once my phones are paid for. Thanks for this very informative piece of information. Thanks for the comments and I am glad my articles and videos have helped you out. Keep an eye out for more reviews and updates for 2018. Does it work with the Iphone X??????? Hmm…I’m getting the impression that all the problems I’ve had switching Tracfone service from one iPhone to another has to do with the fact that we’re using Verizon phones/SIMs, and that it would be much more straightforward if we used AT&T phones and SIMs. The only reason we have Verizon models in the first place is because that’s what my sister originally gave me when she gave me her old phone. But if there’s no reason to continue with Verizon models from here on in, when it comes my turn to buy a new iPhone, I’ll go straight for AT&T. Does this make sense? Yes. that is sometimes as issue, but I’d say I hear about less problems lately. Some phones are compatible with either network and can be switched. What model phones do you have? First case, back in September, which was ultimately solved: going from a 5 to an SE. Second case, ongoing (in fact, I’m about to call Tracfone back now): going from a 5s to an SE. Sometime in the spring, I’ll be upgrading from my 5s to an SE, and want to avoid this problem. If you are having problems using an iPhone SE with Tracfone’s Verizon network you can switch the phones to their AT&T network. You’ll need some new nano SIM cards. In the past, the data on tracfone’s Verizon network had a max download speed of 5Mbps, but not any longer. Keep in mind that you may have visual voice mail with tracfone’s verizon network but won’t get it with their att network. Thanks. The problem was finally fixed. I can’t wait to go through this again, when it’s my turn to get a new phone. I can confirm that an iPhone 8 Plus works on the Tracfone network. I purchased a new “unlocked” iPhone 8 Plus from the Apple store on September 26, 2017 (i.e., Model A1864 (GSM phone)). I then purchased Tracfone’s Bring Your Own Smartphone Sim Kit from Target ($1). I inserted the AT&T Nano SIM card from that kit into my iPhone and then transferred my existing Tracfone flip-phone cell phone account to my iPhone 8 Plus via Tracfone’s “Activate your Phone” (I’m Bringing My Own Smartphone) web page. I entered my SIM card number and answered a few questions and that was it. My Tracfone account was transferred to my iPhone within one day. My iPhone 8 Plus is working perfectly with no problem. All of my minutes were transferred, but I did have to purchase data ($10 per 1 GB) and text ($5 per 1,000 text messages). The data and text were purchased on the Tracfone website and were added immediately to my iPhone. My “days of service” were transferred as well. thank you for sharing this with everyone. The comments and replies here help out others that read these articles! Lots of great advice here. Just wondered if you knew for sure if “days of service” also get transferred from an existing Tracfone, non-smartphone to a BYOP smartphone, along minutes and texts…? (I realize I would have to purchase separate data for the new phone.) Thanks. Yes it will. It did for the few I transfered for people. The only thing I am not currently sure is what refill options they will offer for your new phone. Not sure you will have triple minute plans available. possible just the same plans they offer the same plans you see when you add it the phone into the cart. Can an iPhone 7 Plus be used with tracphone? Yes you should be able to use your iPhone 7 Plus.. it can take a look at the links to the articles and videos on the page you commented on. Let me know if you have any questions afterwards. If you have the phone try the sim and see if it works. If you are looking to buy the phone and there is a good chance it’s SIM or activation locked. I took a look at your screenshot. I am not familiar with https://iphoneimei.net/ but it looks as if it is saying your phone is locked. I don’t cover 3rd party unlocking services, jail breaking, or rooting phones on smartphonematters.com. I do get several questions a week about buying inexpensive iPhones from Straight Talk/Net10/Tracfone to use with other services. Many of these readers report that the phones are activation locked and they are unable to use them with another service. Recently these carriers have been offering attractive prices on the iPhone 5s, SE, and iPhone 6 to lure it new customers so more people are asking about this. I don’t recommend buying the phones for that use. Sometimes it is possible to buy a phone from one of these carriers and use it with another but I have found that is usually when you have paid full price for the phone. And you never can be certain it will work until you try it. If the phone you have was used on Tracfone for 12 months you may be able to get tracfone to unlock it for free. Will I be able to transfer a tracfone account and number with the same SIM card to a used AT&T iPhone 4? If you have a tracfone micro SIM card that uses the AT&T network put it in the iPhone 4 and if it works you are all set. If the SIM is from a basic phone and doesn’t work or isn’t a microSIM you’ll need to transfer the service to a new SIM card which you can buy in target or bestbuy for $1. If you are planning on buying this iPhone 4 I’d consider the cost vs a newer model. The iPhone 4 doesn’t support LTE and Apple doesn’t provide software updates anymore. Ok. wanted to make sure someone wasn’t trying to sell you an iPhone 4. Hi, I stumbled upon this discussion looking for an answer to a similar question, so wondering if you might have an answer to help us out. First, even though we live in no-where-land, Iowa, we always had good cell reception with tracfone and we’ve had assorted tracfones for over 15 years. UNTIL we decided to upgrade our android phones (LG and Huaweii) to iPhone 5s we bought through the tracfone website. We know we were on the Verizon system with the androids, but now, apparently, are on the AT&T system due to the iPhones. So, we have “NO SERVICE” continually displayed on our phones when at home, even though both tracfone and AT&T claim to have good coverage here. We have talked and talked to tracfone, done all their resets on the phones, etc, but, of course, since customer service is iffy with them, have had no resolution to the problem. So, down to the question…..is there a way to change the iPhone 5s’s we bought through tracfone to the Verizon (CDMA) system and get them off the AT&T (GSM) system? Even though customer service stinks and we’re having this issue, we prefer to stay with tracfone, as we don’t use the phones enough to warrant the $40 – $50 per month per phone to switch to a Verizon or US Cellular prepaid. Thanks for any help/advice you can give us! The only option I can think of is to check the serial number(MEID) of your phone with tracfone wireless to see if you can activate the phones as BYOP on their ?Verizon network. Look at the latest video on my youtube channel about the G5 to see what I am talking about. https://youtu.be/bJDO0q6HpAs. If it says your phones are eligible, transfer your service from the AT&T SIM to a tracfone Verizon SIM card. Its possible the phones might be eligible. Check and let me know. If not, consider selling the phones on eBay and replacing the phones. I always recommend that you check with tracfone support to find out which network there phones use before buying if you live in an area where you don’t have service on either ATT or Verizon. Sometimes this happens the other way too. People buy a phone from Tracfone that uses Verizon towers and later find out that really wanted a phone for the tracfone ATT network. If you’d like to upgrade from tracfone, consider Total Wireless. It is owned by Tracfone, uses the Verizon network. You can get an amazing deal in the iPhone SE. You can get unlimited talk and thext for $25 per month and add data as needed. Or a shared family plan 2 lines for $60 see my video https://youtu.be/AE7MfsWXxmQ I don’t know how much you are spending on tracfone per year so Total Wireless may be too much. Hi & thank you for the information. Nothing worked, but it was worth a shot. At one point, even Apple tried to help us make a switch! Tracfone will not refund the phones even though they are the ones that said they would work, but now say ‘of course they won’t work-you have no AT&T coverage in your area.’ We’d change to someone else if we could afford it, but that’s not an option right now. What do I need to look for specifically to know whether the next phones we get will be on Verizon towers/CDMA? There are some iPhone 5s on Walmart.com that say ‘unlocked’ and have no apparent tie to any cell provider, but want to make sure we don’t mess up again. You checked the MEIDs of your phones? Can you email them to me so I can check? bob at the name of my website. Can I do just a contract for a iphone 6 but as a trac phone without setting up service through a company. Then just make monthly payments on the phones? Are you saying you want to buy an iPhone 6 on lease or a payment plan? And that you don’t want to do it though a company that requires you sign up through a cellular service plan? I GOT A SMART PHONE FROM SAFE LINK AND I KEEP HAVING TROUBLE WITH IT ,IT KEEPS SAYING CELLULAR NETWORK NOT AVAILABLE. WHAT CAN I DO TO GET IT WORKING? safe link says its activated but i got a letter to activate it or they will cancel me. please help. if the SIM card in the phone? I’ve never used safelink myself. Where there activation instructions in the box? Do you see signal bars in the top of the phone? I DIDN`T EVEN GET AN ACTIVATION CARD WITH IT. IT SAYS TO CALL SAFE LINK I CAN SEE SIGNAL BARS ON THE PHONE. does anything work? calls? text messages? Ah.. ok. now I understand your question. This article was before the iPhone 7 and SE, but I didn’t mention the iPhone SE. While I generally update articles on smartphonematters.com from time to time, I usually don’t update reader responses. Good news for you is the iPhone 6s / 6s Plus, iPhone SE, and iPhone 7 / 7 Plus work too. Thank you for this encouraging response. I’m a senior and using the TracFone service for years without a smartphone has resulted in several thousand minutes accumulated. I’ve read that minutes auto xfr to data usage so I’m assuming that if I use smartphone fearures mostly on wifi, the banked minutes should allow for a seamless transition with no change to my annual subscription renewals. Also, I live in the 95051 zip code area and curious if the network used by TracFone is suitable for smartphone services. Also, any advice as to how/where and which iPhone 7plus to purchase. Thank you again for your assistance. If you have a balance of unused minutes they will transfer to a smartphone but I am not sure they will can be used for data. The used count a text message or MB of data as a minute or a fraction of a minutes. These days the plans come with separate minutes, texts, and MB of data. Regardless, you can add data to your account for $10 per GB and it doesn’t expire so long as your phone is active. Its relatively cheap to add data. Also did you know that when you buy a refill online, you can add 365 service days for $49. in the future you can buy the least expensive refill and add a year of service days. I think I’ll do a longer video response to your question in the next couple of days. as a lot of people might be interested. For now, check out SIM-free iPhone 7 and 7 Plus Available For Order and Unboxing My New iPhone 7 Plus. The apple store is the best place to buy the a new iPhone 7 Plus from. You may also want to consider waiting until September as supposedly there may be big changes to the iPhone. I’ll reply again after I have posted my video response. Can I use new at&t locked iphone6/6s with tracfone BYOP? I have an existing tracfone phone and number with them and I have plenty of minutes/data/text with it. Can I transfer all of my minutes with the new one?How? I wanna retain my number, is that possible? Or do I need to buy a sim card? A locked AT&T iPhone 6 or 6s will work with Tracfone’s AT&T network. If you current phone has a nano SIM, you should be able to move it to the iPhone. If not, the sim will be too big or too small to fit and you’ll need to transfer your service to a new SIM. Your number and balance will transfer. I did this for someone back in Jan 2017 with no problems. I have a Verizon iPhone 6 currently without service. I went to the Tracfone site, gave it my IEMI and it verified. So far so good – they are sending me a SIM. Can I do a reset on my iPhone before activating the new SIM? What about if I later decide I want to reset the phone. Will it be “good” and active afterwards? Resetting your phone will have no impact on whether or not it compatible with Tracfone. If you want to reset the phone, go ahead. I think what I am concerned about is the what-if it doesn’t work maybe. Currently the phone has value to me as an Internet device for instance, using it for a quick look at my security system through an app. Once I reset the phone, it will no longer function until it is again activated. That is what makes me nervous. Currently I am thinking I’ll leave it as-is. Get it activated with Tracfone and make sure all is good. Then reset it. After resetting the phone, how hard is it to reactivate? You can do that but it shouldn’t be a problem. You should be able to activate the phone with ANY sim. Even an inactive one. The phone isn’t on contract and its unlocked so it should be ok. If for some reason you have a problem, just borrow and active Verizon SIM from someone. Can You use an Apple iPad 2 Wi-Fi + 3G with Tracfone’s BYOP program? Not as a phone. The data should work. If you have an AT&T phone sim try it in your iPad if it works the tracfone ATT sim should work too. You’d have to do the math to see if cost wise it would work out to be a worth while deal. You could buy 1GB of data for $10 that will continue to carry over while the account is active. But, you’d need to add minutes to the account to keep in active. I have an iPhone 5 from Bell Canada, and would like to use it for my tracphone account which I already have. Can this be done keeping my tracphone number? I want to use it while in Florida for three months. To use that iPhone with tracfone it needs to be unlocked. I am not sure if it shipped locked. It looks like Bell charges a $50 fee to unlock the phone if it is eligible. You can check if the phone is locked by borrowing an AT&T or T-Mobile nano SIM from someone. Put it in your phone and if you can make a call its unlocked. If you can make a call, you then should be able to transfer your service to a tracfone sim and keep your number and remaining service balance. You’ll have to decide if you want to use tracfone’s AT&T or Verizon network. If the phone is unlocked the AT&T SIM should work. If you want to use the Verizon SIM you’ll need to check the MEID of the phone with tracfone to see if it is eligible. I am not sure if Bell Canada used the GSM or CDMA iPhone 5. Whats the model number? Does this work with the iPhone 7? Yes you can use the iPhone 7 with tracfone. If your buying a new phone, the best option is the SIM-Free option from the Apple Store. It’s compatible with the AT&T, Verizon, and T-Mobile networks that Tracfone uses. If you want to use Tracfone’s Verizon network, you’ll still need to check the MEID (serial number) of the phone to make sure your can use the phone. The SIM free model should be ok. Waiting on some foreigner on the other side of he plantet to provide an indecipherable answer to my simple problem . Are you going to answer my question or send me to you raise of faq’s that have nothing to do with my problem? smartphonematters.com is a privately owned website. I write about prepaid wireless with a focus on BYOP plans. I don’t work for tracfone nor can I fix your problem. My best suggestion for you would be to send a clearly written email to tracfone support at TF.CorpResolutionTeam@tracfone.com. Tell them what the problem is. Ask them why your phone stopped working if you haven’t used up all your minutes or they haven’t expired. Include relevant details. Like your account / phone number, when you added the minutes, and the service pin used if you had one. It’s best to omit the types of comments you left here about things like off-shore support or FAQs that did not help you as that won’t aid in resolving your issue. Irecently added 450 minutes. It no longer works. I cannot make a call or send a text. Can yo guys fist they? I just bought sigh phone a couple of years ago added 450 minutes it no longer makes a cll or sends a texas. How about fixing this for e? Thanks for your helpful information! I’ve got an available Verizon iPhone6s. My wife is currently using a GalaxyS3 on Tracfone BYOP. I’d like her to switch to the iPhone. I’ve already tested the IMEID at Tracfone and it is compatible. 2) Size: GalaxyS3 is micro-sim and iPhone6s is nano-sim. I’ve seen articles that show how to cut down a micro-sim to nano-sim size easily. I’m okay doing that, but should I just order a new sim? Is the process of getting/activating a new sim for an existing BYOP a hassle? 3) Are you sure that newer Verizon iPhones are “unlocked” or do I have to get Verizon to it unlocked first? 3. All Verizon iPhone models are unlocked, starting with the iPhone 5. 1-2. While it’s possible to cut a SIM, I no longer recommend it. Order a new SIM online or check Best Buy or Target for a Tracfone $1 sim kit. You really dont want to move the SIM. FYI – tracfone offers service on either the AT&T network or the Verizon network. You did not mention which network the S3 is currently using. You can use either their AT&T or Verizon network with that iPhone 6s. You’ll need the current nano SIM for the network you want to use. And, if you want to use the verizon network, that is when you need to enter the MEID / IMEI of the phone into their website. Pick the network that works best in your area. Data service on their Verizon network is at speeds up to 5Mbps. Their AT&T network does not have that restriction. The Galaxy-S3 is on Verizon as well. She is not a big data user so that restriction is not a big deal. Thanks for pointing it out. So you feel that getting a new sim is not much of a hassle? After obtaining, would I then just go on the website with the new sim and transfer to the new phone? Would I be forced to add more time to the plan at the same time? I’ve got alot of time/data left on her current plan. Was hoping to avoid that. Your wife’s phone number and remaining balance are transferred to the new SIM. I wrote an article about doing this for another tracfone brand, straight talk. The process should be pretty similar. If by chance something doesn’t go smoothly you can email tracfone support and they can straighten it out. I also did this for tracfone a few years ago Using an iPhone for $7 a Month – Part 2. That video is a little outdated now. If you give it a try, let me know how it goes. Great news. I am glad to hear the transfer went smoothly and made the 6s a great Chistmas gift. Five minute transfer time too! Thanks for taking the time to share an update. The comments on smartphonematters.com are a great resource for others. My daughters both got hand me down Verizon iPhone 5s phones. They transferred their text, data, and minutes to their “new” used phones. Despite getting the OK from Tracfone before hand, their phones will not access the internet using their data and get error messages when they try. They only work via wifi. Apparently there is a glitch in the matrix. Tracfone has no idea how to make either phone work with their service plan data. It will work for tracfone too. I’m a Verizon customer but thinking of using my IPhone 5s as a tracphone. I want to see about triple minutes for life. Will I be able to do this? For BYOP smartphone plans, tracfone seems moving away from the double and triple minute plans. And, I think this might be a good thing because after a while it gets a little confusing to figure out how many minutes you are getting for your money. we could talk more about this, but I’d start off by asking how many minutes do you use a month? how many text messages to you send, and how much data do you need? Once you know this it becomes easier to pick a prepaid wireless plan that meets your needs. Take a look at the rates on this page https://www.tracfone.com/direct/Purchase?payGo=true&app=TRACFONE&smartPhone=true&lang=en. expand all the options, and try to compare the prices for the one year and pay as you go plans to the smartphone plans. Now in some cases the One Year and Pay As You Go plans double or triple but the smartphone plans don’t. gets confusing quickly doesn’t it.